CurbVault® is an outdoor anti-theft and anti-vandal receptacle built to protect mail and other personal information deposited by the Postal Service. Please note that it is unlawful for private carriers such as UPS and FedEx to deposit items into any U.S.P.S. mailbox! Modified versions of the CurbVault® are available for that purpose and can be purchased through Mail Theft Solutions, Inc. The elegantly unique and patented design of the CurbVault® enables it to complement the finest of homes. 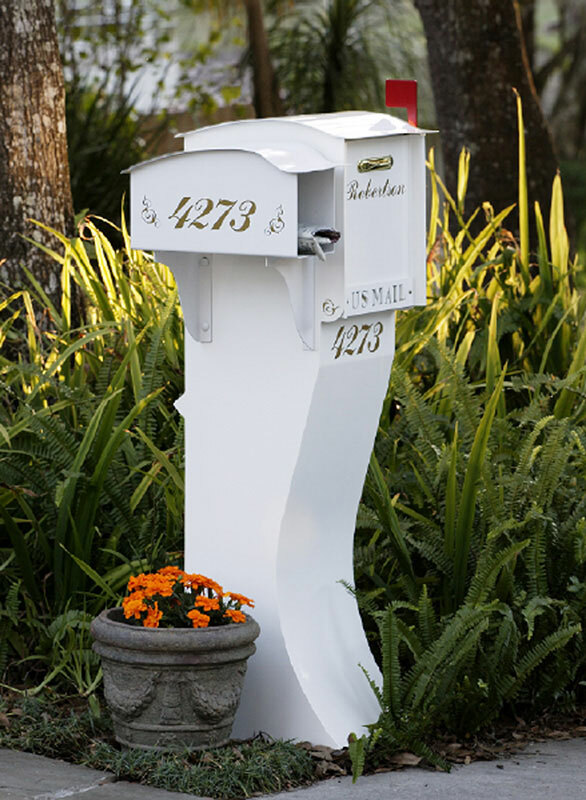 In addition to residential use, both versions (the U.S. mailbox and the non-mail anti-theft portal) have tremendous commercial applications for securing valuables, classified documents, and even checks. Why do I need a CurbVault®? Mail theft and identity theft via the mailbox is an epidemic that continues to grow each year! Mailbox vandalism is also a growing concern faced by homeowners. The CurbVault® fights both by keeping your mail safe and secure! Not to mention its 3,200 cubic inch storage capacity keeps you from going through the hassle of having the Post Office hold your mail when you take extended trips. Is the CurbVault® really 100% made in the U.S.A.? Completely true, we believe in supporting our country so much that we want the CurbVault® to be entirely domestic. While some companies say that their products are made in the U.S.A. they only mean assembly. At Mail Theft Solutions, Inc. "100% made in the U.S.A." means exactly what you think it should mean - even the heavy-duty powder coating process is done domestically. When we say 100% made in the U.S.A. we mean that you are buying a product that you can trust and do not expect anything less from a premiere product like the CurbVault®. Where and how is a CurbVault® installed? The CurbVault® is installed wherever your deliveries are normally made. It comes with a fully illustrated Owner’s Manual, showing step by step, the correct mounting procedures. The CurbVault® comes with its own invisible in-ground mounting bracket or it can be bolted to a concrete pad. Why is a CurbVault® better than brick or stone enclosures? In many areas of the United States, such enclosures are being banned by the D.O.T. because of potential hazards from automobile collisions. Severe damages, personal injuries, homeowner liabilities, and even deaths are increasingly related to collisions with these brick or stone enclosures. They also hold no more mail than a conventional mailbox. The CurbVault® includes a “break-away” mounting system to make sure that the entire unit will safely give way to any substantial impact delivered by a vehicular collision. Can I construct a brick or stone enclosure around the Curbvault®? You can. However, the CurbVault® is 21st century technology, both in function and in looks. In some communities a brick or stone enclosure is not permitted, check with local policies before building. What is the purpose of the Catch Tray? The Catch Tray, located at the rear door opening, allows easier access to mail when the CurbVault® is in its anti-theft mode every day. It simply catches the mail about two-thirds of the way down before it hits the vault’s floor. This tray can be removed for lengthy trips to make use of the full storage space available in the CurbVault®. Just reach in and slide it out, it is that easy to remove from your CurbVault®. What is the purpose of the Convert Tray? The patented Converter Tray, located inside the deposit door opening, converts the CurbVault® from a very large conventional mailbox into an anti-theft mail vault. When the tray is in its top position, it becomes a shelf for out-going items. From that point on, all deposits fall downward into a secured area, beyond a diverter section. Mail must then be retrieved from the rear of the unit, accessed by a key. No key is needed to re-lock the access door; it could not be more secure and convenient. It will lock automatically when closed. The CurbVault® can therefore be a full-time anti-theft unit or only be secured for the times you are out of town. The Converter Tray option allows you drive-up access to your mail from the front on a daily basis when you prefer. What colors are offered and how durable is the finish? Available colors include Satin Black, Sky White, Caribbean Sand, and Hammered Bronze. The finish is created through the very latest technology in baked on heavy-duty powder coating. We guarantee that this coating will be free from defect for one year from the date of purchase though the coating industry projects that the finish will last for several years. What about the warranty, parts and accessories? Since the CurbVault® is constructed from all-welded non-rusting galvanized steel about an eighth of an inch thick (and has no hinges to stick or wear out), its structure is warranted for the lifetime of the original owner. Trays are not warranted against loss! The finish, the handle (easily purchased at Home Depot or Lowe’s), and the lock carry a one-year warranty. A complete price list of all parts and accessories are in the furnished Owner’s Manual for purchase from the CurbVault®’s manufacturer, Mail Theft Solutions, Inc. If you have any issues, before or after the sale, please call our toll-free Customer Service Hotline to speak with a LIVE representative. Yes! The CurbVault® is approved for sale and use throughout America. It is presently being used in all 50 states by homeowners, businesses, and government agencies. The CurbVault® meets or exceeds all requirements and mandates outlined by the U.S. Postal Service. Many communities, however, have neighborhood covenants that require conformity with other mailboxes having the same appearance. Be sure to check within your community before purchasing your CurbVault®. Mail Theft Solutions, Inc. is not liable for such violations, and unauthorized units that cannot be installed are not returnable.